So I am reviving this blog again. Mostly because I just really need a writing outlet (grad school + full time job + part time job = insanity!). Okay, I need a writing outlet that does not involve research papers and pedagogy and cooperative educational theories…you get the idea. In one year (I’m guessing, they don’t have the date of the race up yet) I will be running a Marathon. Yep. I’m only overweight, out of shape, with a pulled back muscle and bad knees, but whatever. I’ve done two half marathons, I’m not getting any younger, and I want to start crossing things off my bucket list. With the bad back, I am limited to walking and light yoga for a few weeks. It’s all good. I’ve got time. The marathon is in a year. I’m using this blog as a means of accountability. I am determined to be honest with the blog, so that means if I post that I went on a three mile run, I actually have to have gone on a three mile run. Honestly, I sometimes think that if I’m skinny all my problems will go away. Not true. Not true at all but I admit to having those thoughts. Doesn’t everyone? I also just really want to be able to be the athlete I am without getting hurt all the time. Seriously. I am actually really athletic. I just told you I ran two half marathons. That’s 13.1 miles people. Twice. I play softball, I do zumba, I like to hike. I just wish I did it all with some consistency and had better self control when it comes to food. I love food. And reading and watching TV and sewing and painting and crafting and all sorts of indoor activities that sometimes (a lot of times) get in the way of the working out. No more. I am resolved to try. I’ve given up resolving to succeed, because then I just get frustrated with a lack of results (after, like, a week) and go back to my old habits. New goal: trying. I am going to try. And I have some awesome rewards. I got three fantastic dresses on super clearance at modcloth.com (freaking AWESOME site, btw) and they are all just a bit too small. Progressively so. One is just a bit tight, then the next is a bit smaller, and one is my end-goal dress. I love them and I really, really want to wear them so I am hoping that dangling cute dresses in front of myself will remind me one, why I am attempting this, and two, these things take time. They don’t happen overnight. So, here goes nothing Internet. 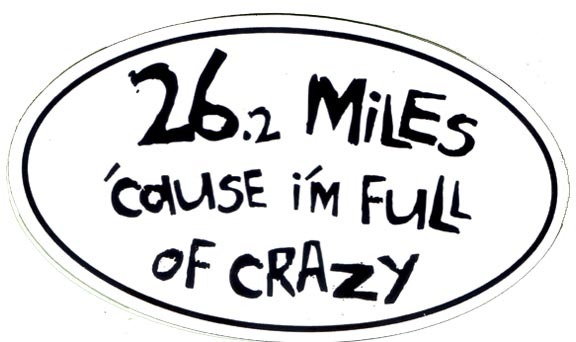 365 days to 26.2 miles. And with any luck, without about 20 (or 30) pounds.